Treat and control unwanted parasites like flukes, tapeworms, flatworms, and turbellarians in your reef tank. Start treatment with as large a water change as practical or start with new water. Any water used should first be conditioned with ULTIMATE or a combination of Liquid Buffered ClorAm-X and Stress-X to remove ammonia, chlorine, and chloramines. Do not stop filtration, but remove activated carbon and stop foam-fractionation (protein skimming) and UV sterilization. SHAKE VIGOROUSLY before use. Measure Aquarium Solutions Liquid PraziPro at the rate of one (1) teaspoon per 20 gallons of water to be treated. (one (1) fl. oz. per 120 gallons) Measure Pond Solutions Liquid PraziPro at the rate of one (1) teaspoon per 32 gallons of water to be treated. (one (1) fl. oz. per 200 gallons) This produces a concentration of 2.5 mg/L. Distribute the proper amount around the edge of the aquarium or pond or directly into the filter box to achieve the best overall distribution. A single treatment lasting 5-7 days is normally sufficient. Repeat as necessary, but no more than once every 3 to 5 days. May be used as a preventative, at the standard dosage, when a disease is likely. Do not use with other drugs or disease treatments. May cause temporary foaming. 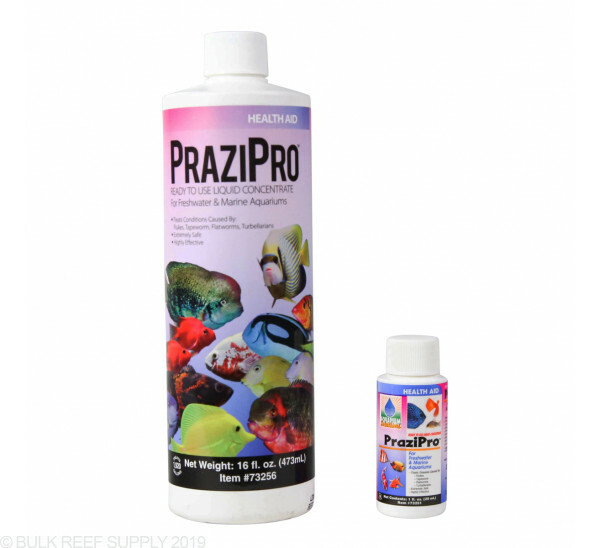 I really like Prazipro it works for fresh and saltwater and is also safe for scale-less fish. It works well especially when a new tang is introduced. Great preventative product to keep the parasites away. So far have seen none. I soaked all of my rock in this, and worked great. All of the live creatures that I wanted, were fine and helped eliminate an Ich outbreak that I had when I first got the live rock. Can this be added to an existing reef tank? Is it safe for inverts? This is reef safe for coral and inverts. Feel free to let us know if you have any further questions. Can this medication be used in a QT tank at the same time as copper meds? There should be no interaction problems between prazinquantel and copper meds. It's quite common for both to be used at the same time in QT. I have a reef tank with all types of corals and inverts! Is this product safe to use in the reef tank ? This is reef safe for corals and inverts. Have a great day!